The life of actress Camila Quiroga (1891-1948) seems to have been forgotten. 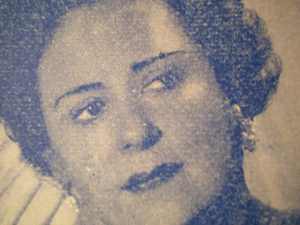 In 1943 an autobiography in a magazine detailed her trips around Latin America and Europe, and discussed her pro-proletarian film Juan sin ropa (1919). Juan sin ropa’s scheduled release unfortunately coincided with Argentina’s Semana Trágica (“Tragic Week”), when a series of labor revolts in Buenos Aires were violently suppressed. But 60 years after her death, interviewees throughout this documentary bring to light more intricate details and stories about the acclaimed actress that would have been otherwise left forgotten. Gerardo Panero was born in Chivilcoy, Argentina in 1980. He graduated from the Escuela Nacional de Realización y Experimentación Cinematográfica in Argentina where he took courses in documentary film, sound, and music. He has written and directed two award-winning short documentaries which have been shown on national Argentinean television. He has also worked as sound director on feature documentaries, advertising and television.